This story would have been highly improbable for anyone but Constance Helmericks, a seasoned explorer, adventurer, Alaskan camper, hunter, trapper and canoeist. For her, however, she’d had enough of the daily humdrum, the closed-in small sky in the U.S., and smog, so she found homes for the family pets, and took her two daughters, ages 12 and 14, on a two-year trip paddling through Alberta, Canada, while living out of their 20-ft., 180-pound Chestnut freight canoe. They paddled the Peace River to Lake Athabasca, and then the Slave River to Great Slave Lake, and crossed it with intentions to spend the winter in Yellowknife. 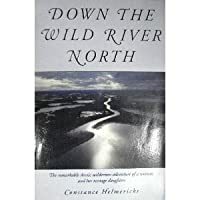 The second summer they came back down Great Slave Lake, went up the Mackenzie River, crossed the Arctic Circle, and concluded the trip in Inuvik. The experiences they shared were life changing for all of them. They faced several near tragic experiences, but in seeing them through, you see the girls mature. There are those experiences on the water, and then those that threaten to wreck the trip, like when Ann suddenly requires two major operations that test the ingenuity of pilots, doctors, and hospital staffs in order to get her from the wilderness to medical facilities. Experiences unfold when they meet missionaries, native peoples, true wilderness recluses, fishermen, tug and barge crews, homesteaders, all of whom they live and interact with. Through their eyes you see the wilderness change as it is threatened by oil exploration, over-populations, and government manipulations, and the resulting impact on the land and wildlife. For real adventure and excitement, this book is unbeatable. Short of making such a trip yourself, you will be unlikely to find better insight into a real canoe adventure and life in the Northern wilderness.